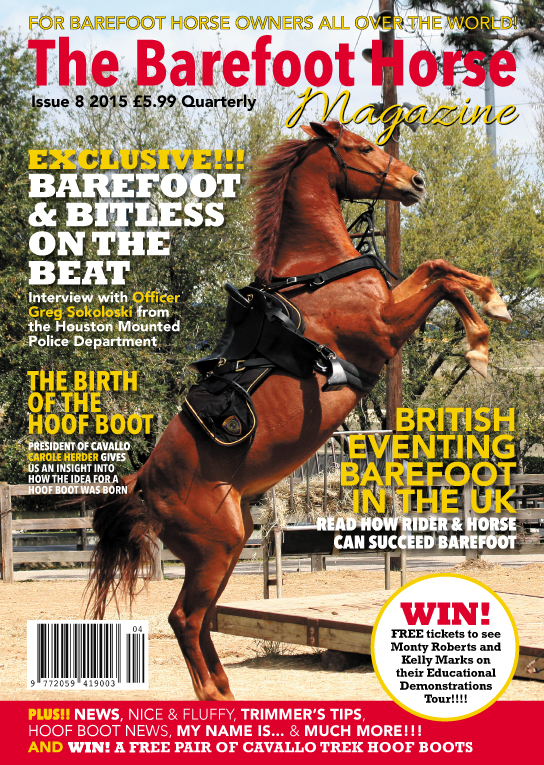 Home / Barefoot Blog / Back Issue Focus / 😁 🐴 Do you remember Shadow (AKA Texas Star) from the front cover of Issue 8? 😁 🐴 Do you remember Shadow (AKA Texas Star) from the front cover of Issue 8? Well this year he is starting his 16th year as a police horse for the Houston Mounted Police. Still happy, healthy & of course barefoot – as all the working horses at the HMPD are. Officer Greg Sokoloski (now retired) was Shadow’s partner, and the man largely responsible for instigating the pioneering change from shod, unhealthy horses who were often off work because they couldn’t cope, to a barn full of barefoot police horses, healthy, chilled and ready for work every day. The story of how the HMPD went from spending thousands of dollars on propping up unhealthy, unsound horses to changing their equine management, training & hoofcare, is one not to be missed. Read all about it in Issue 8 which is one of the printed back issues in the January 50% Off sale. This story you will be recounting to friends, family & professionals forever! Next post: 🤔 So here’s the thing. When we say all horses can go barefoot, what do we actually mean?